How tall is the Arsenal Clock Tower? 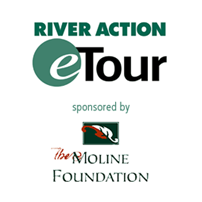 | River Action, Inc.
Across the street from the Mississippi River Visitor Center is the large limestone Clock Tower Building, which was constructed in 1863 as the first building of the Rock Island Arsenal. Near the top of its 117 foot tower are four twelve-foot diameter clocks that are visible for miles in all directions. Originally, the building was used for storage of arms and supplies. Shortly after World War I it was ordered to be torn down. However, because of local interest in the building, it was not demolished, although it stood unused for several years. Then in the early 1930’s, the Clock Tower found new life when the US Army Corps of Engineers began the construction of Lock and Dam 15 at this location. The Corps began using the first floor of the building as offices, and by the mid 1930’s all three floors were filled. 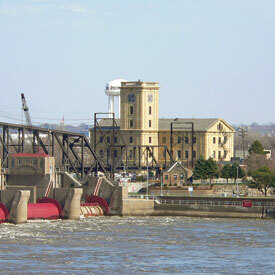 Since that time the Clock Tower as been the headquarters for the Rock Island District of the US Army Corps of Engineers. The Rock Island District is one of six districts that comprise the Mississippi Valley Division of the Corps. 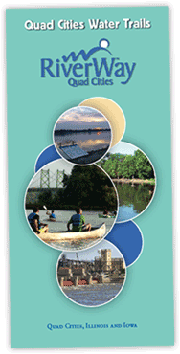 It covers more than 78,000 square miles and includes 314 miles of the Mississippi River from Guttenberg, Iowa, to Saverton, Missouri; and also 268 miles of the Illinois Waterway from Lake Street in downtown Chicago to the LaGrange Lock and Dam, southwest of Beardstown, Illinois. Northeast of the Clock Tower and east of the Visitors Center is an environmentally-friendly parking lot, constructed in 2003. The Corps of Engineers partnered with River Action to build this permeable parking lot. Its porous surface absorbs the water that would normally runoff into the river. Native prairie plantings surrounding the lot help to clean and filter the water before it reaches the Mississippi. This project is part of “Retain the Rain” which is a project that encourages businesses and individuals to do what they can to reduce stormwater runoff which hurts our waterways. Learn more about what you can do to Retain the Rain at our website at www.riveraction.org. To learn more about the Clock Tower building, Lock and Dam 15, and the Corps of Engineers, we invite you to stop in at the Mississippi River Visitor Center. Park Rangers are on site to answer questions and explain the locking process as the boats pass by. Also available are interactive displays and short films that allow you to explore the river and its uses! Inside you’ll find great views of boats and barges locking through.